Be the first to share your favorite memory, photo or story of Noreen. This memorial page is dedicated for family, friends and future generations to celebrate the life of their loved one. 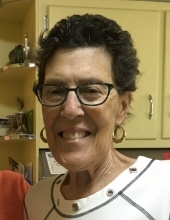 KASLE, Noreen Laura - age 69, of Flint, passed away Wednesday, October 10, 2018. Funeral services will be held at 11am Friday, October 12 at Sharp Funeral Homes, 6063 Fenton Road, Flint. Rabbi Yisroel Weingarten and Leonard Meizlish will officiate. Interment will be at Machpelah Cemetery. Shiva Minyan will be held at the home of Frank and Judith Kasle at 7:30pm Saturday evening, October 13, 2018 and Sunday and Monday evenings, October 14th and 15th at 7pm. Noreen was born September 17, 1949 in Flint, the daughter of Louis and Charlotte (Lewis) Kasle. She is survived by her mother, Charlotte Kasle; brothers: Franklin (Judith) Kasle, Jerome (Shaindel) Kasle; sisters: Joan (Allan Hertzenson) Kasle and Diane Kasle; nieces and nephews, Robert Kasle, Terri (Charles) Kasle-Lerose, Shimon Kasle, Lori (Noah) Bradley, David (Rivka) Kasle, Rebecca (Mike) Aloni, Elana Kasle, Joseph (Tzipi) Kasle, and Adam Hyland; 11 great-nieces and great-nephews. She was preceded in death by: her father, Louis Kasle. Tributes may be share at www.sharpfuneralhomes.com. Those desiring may make memorial contributions to the Machpelah Cemetery Association of Flint, Michigan Humane Society or the charity of ones choice. z'il May her memory be for a blessing. To send flowers or a remembrance gift to the family of Noreen Laura Kasle, please visit our Tribute Store. "Email Address" would like to share the life celebration of Noreen Laura Kasle. Click on the "link" to go to share a favorite memory or leave a condolence message for the family.